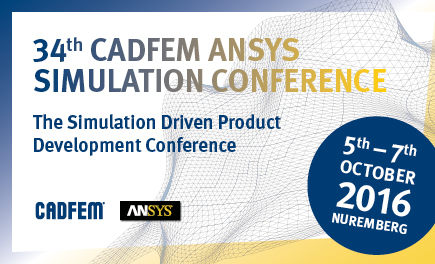 ISimQ will be participating in CADFEM’s numerical simulation conference on the 5th-7th of October 2016 in Nuremberg. Visit ISimQ’s booth within the CADFEM partner area and meet our CFD experts. With more than 800 attendees, the conference is the largest annual computer-aided engineering conference in Europe. It offers information on technology updates, user presentations and compact seminars on structural mechanics, fluid dynamics, electromagnetics and systems & multiphysics. ISimQ will present its innovative services for all aspects of CFD simulation at the accompanying trade exhibition. We will be happy to share our solutions with you!